An interesting thing about modern furniture, and I have never been able to figure out why this is, is that the manufacturers use as little glue as they can! The result is that there are a lot of loose chairs out there!! 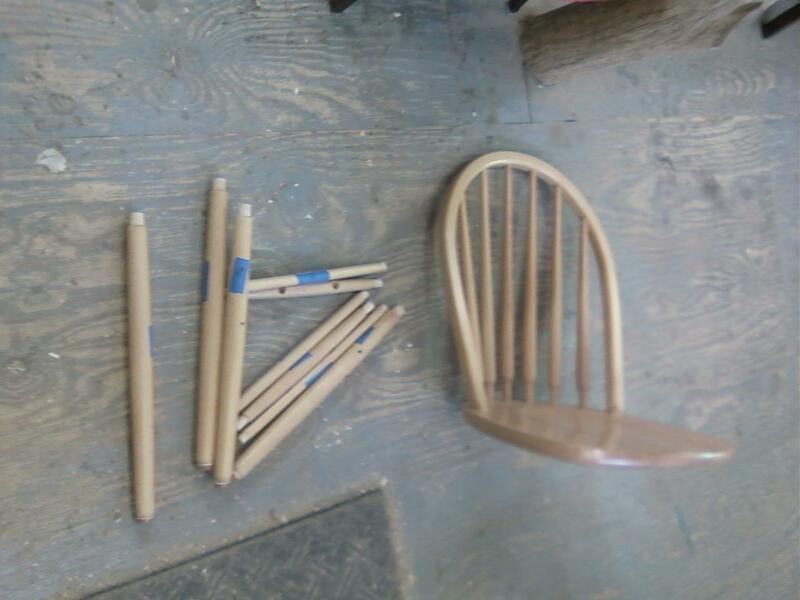 I received six chairs made from Beech that were all loose. In addition, one of the stretchers had fallen out completely and had gone missing. 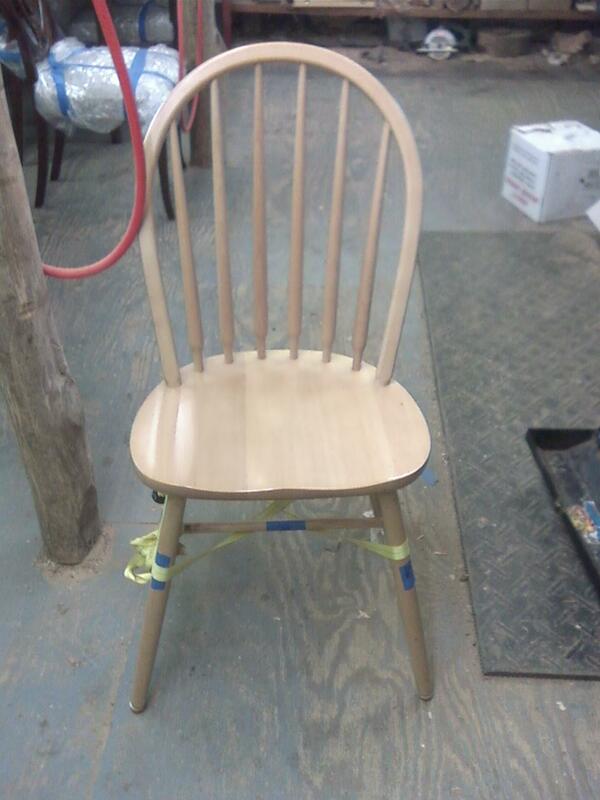 below are some photos of one of the chairs being glued up and the turning of the new spindle. 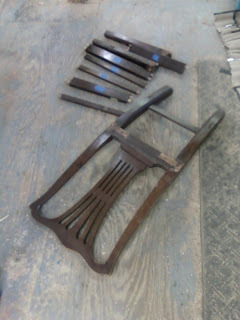 this first photo shows one of the chairs disassembled. 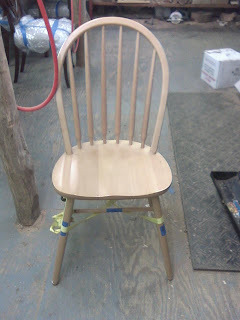 The hoop back on the top is secured by a fox wedge, which is a wedge inserted into the end of the tenon under the chair. this wedge forces the tenon to expand and keeps the back tight. because of this, the bottoms were the only sections that were loose. 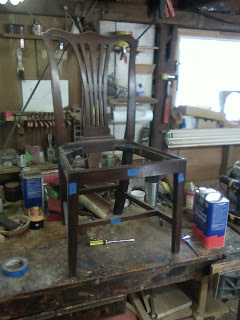 The blue tape seen on the spindles and the legs have the location of each part marked on it so that I don't get confused on how to put these chairs back together! 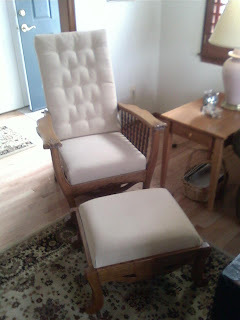 After the joints were cleaned of all of the old glue, the chairs were reglued. 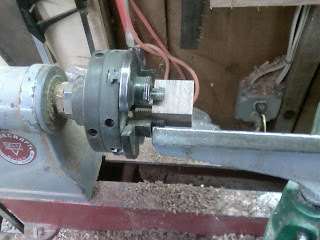 I am using a ratcheting band clamp to keep everything tight. 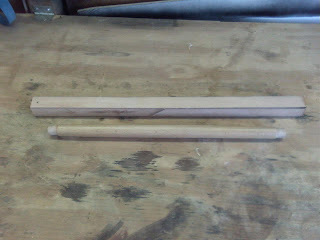 Here is a photo of the turning blank next to the spindle I needed to copy. 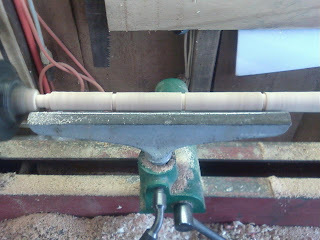 Here is the blank mounted in the lathe. 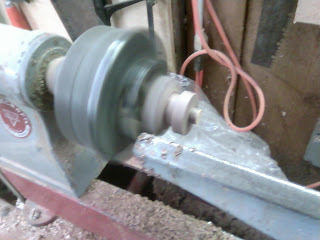 This photo shows the spindle being turned. The first step is to tame some measurements using calipers and transfer them to the blank once those diameters are turned as in the photo below, the spaces in between are flattened out. I forgot to take a picture of the finished product, but I can tell you that it matched exactly! 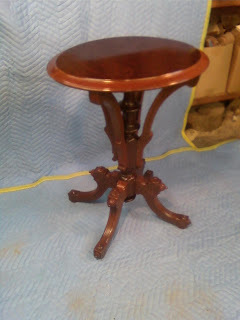 The last step in the repair process for this piece was to turn several ornamental appliques for the table that were either missing or badly damaged. 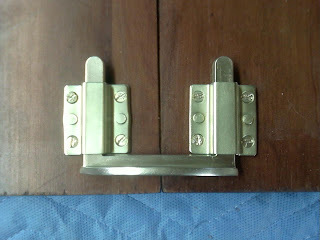 Below are some photos of the turning of the new appliques. 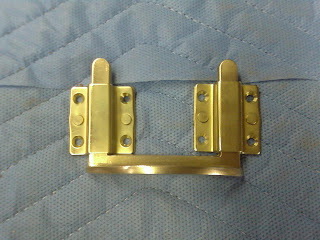 Below is a picture of one of the broken appliques. 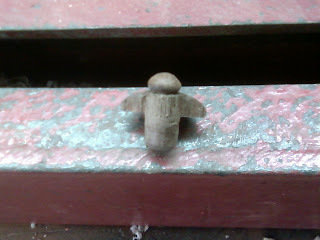 the originals had a turned tenon which connected them to the piece. 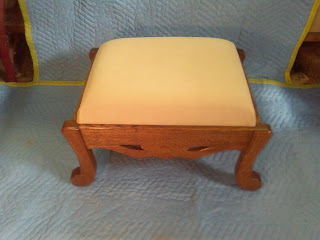 Each applique was about 1 inch in diameter. Here is a photo of the blank chucked in the lathe and ready for turning. 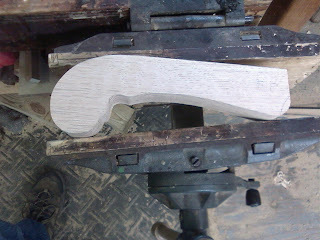 The first step is to turn the basic shape as seen in the photo below. 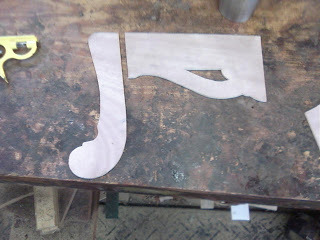 The shape is then refined and sanded and the last step is to turn the tenon seen behind the disc of the applique. 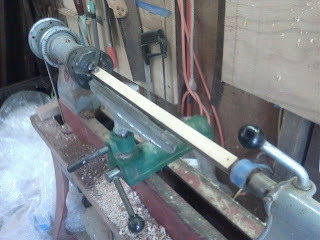 After everything is finished then the tenon is separated from the rest of the blank using a band saw. 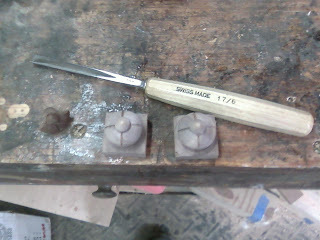 Here are two of the appliques after being turned. 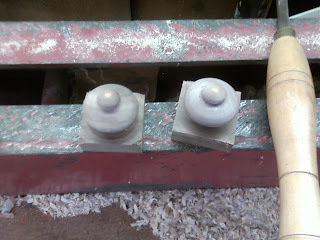 The last step was to hand carve the four lines seen below into the discs. 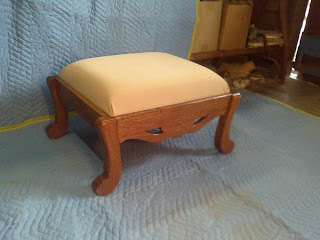 Here is a photo of one of the new appliques attached to the foot of the table. the one to the left facing the left of the picture is an original. 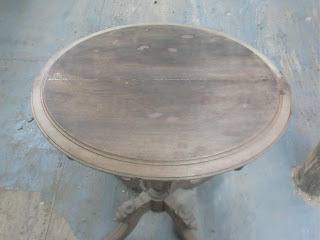 When repairing the top of this table I noticed that the underside of the top had been veneered. 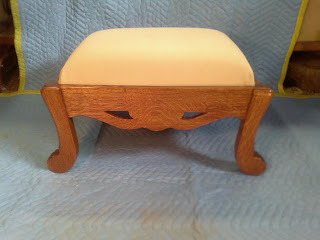 The reason for this is that it is common practice to veneer both sides of a surface so that there is less of a chance that the surface will bow or move. If you ever look at the edge of a piece of plywood, you will notice that the plys are always in odd numbers. 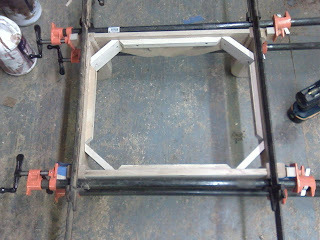 that is so there is an equal amount of tension on each side making the whole more stable. 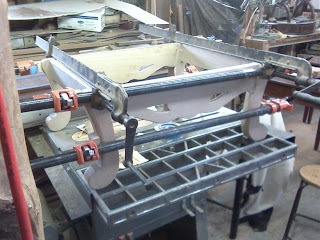 The same is true with veneering a table top. The problem here was that the top veneer was missing! 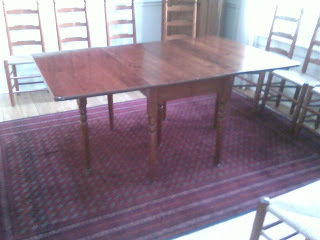 This table has had significant work done to it in the past so most likely the veneer was damaged and simply removed. 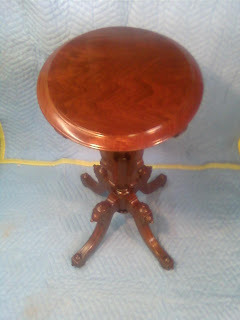 The customer and I agreed to re-veneer the surface. 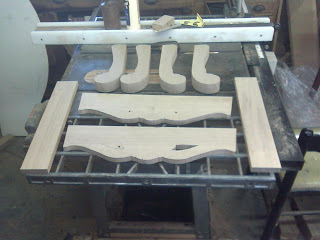 Below are several photos of the process. The first step was to prepare the surface by filling any indentations and sanding the surface to remove any old finish left over. 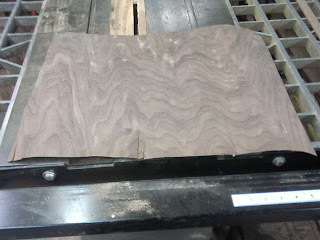 Here is the prepared surface prior to veneering. 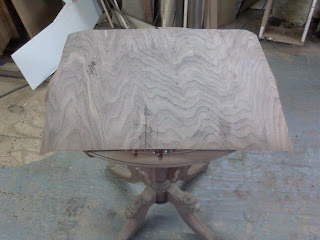 Here is the Walnut veneer chosen for the top. 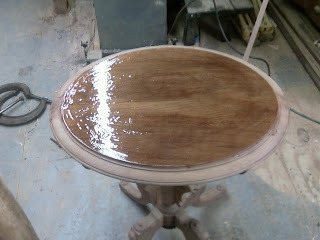 Once prepared, the top surface is coated with hide glue. 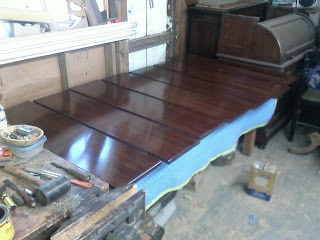 The veneer was then laid in place and clamped for several days with ply wood and long blocks to make sure the entire sheet had good contact. 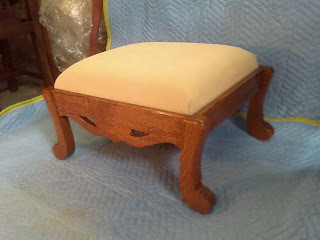 Once removed, the sheet was glued to the top. 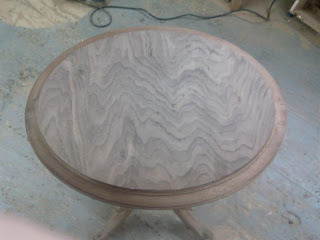 You can see where the glue permeated the veneer in some places. 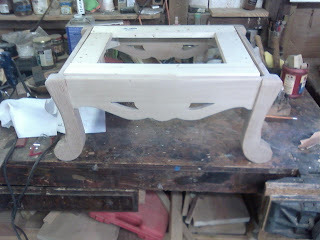 this is sanded off before the veneer is finished. 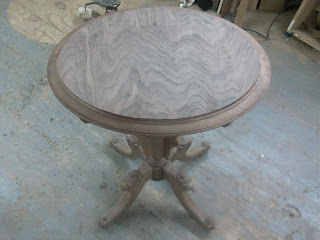 Here are two views of the veneered table with the veneer sheet trimmed to size. 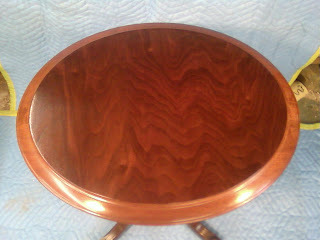 The veneer Will be stained lightly to match the color of the table before finish is applied. 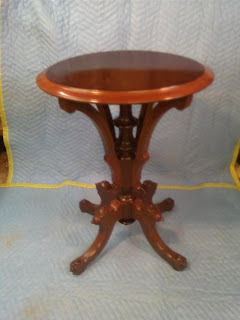 One problem that the customer wanted addressed was that when the leaves were in place, the table had a tendency to open up. The answer to this was to install clips or table yokes. 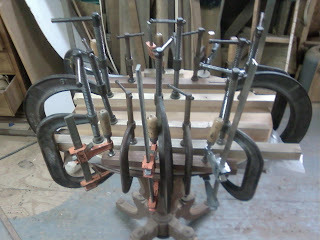 The table yoke is used to hold individual leaves together by connecting them. Below is a photo of the table yoke: The two receiving ends are screwed to the underside of the leaf and the yoke is inserted into both ends, connecting the leaf. 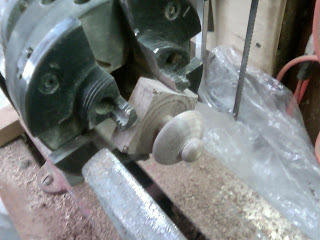 below is a photo of a yoke installed and connecting two leaves. The seam between the leaves is seen running down the center. 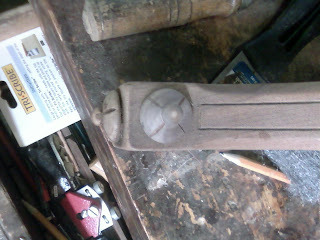 Here is a view of the yoke in place on the underside of the leaf. 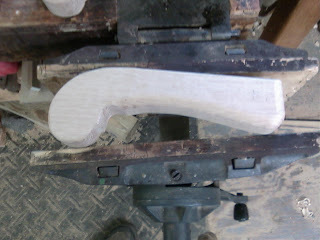 the yoke has a crescent shape to act as a handle for removing. 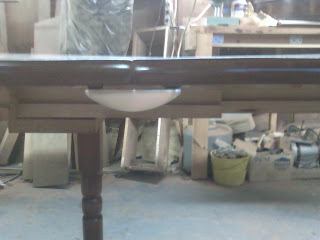 This photo shows the table surface edge on. 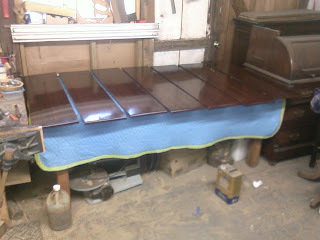 Here are two photos of the seven leaves waxed and ready for delivery. 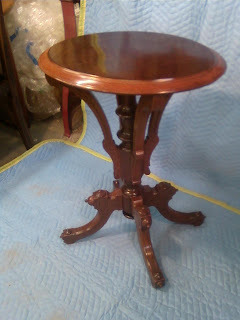 This photo shows the completed table without the leaves. The second photo shows a different view with light coming in from the window. 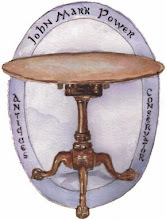 A customer recently called me concerning some loose dining chairs that they had. 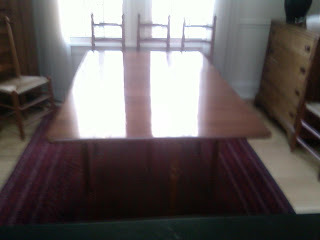 The chairs were Reproduction Mahogany Chippendale Dining chairs and are nicely constructed. 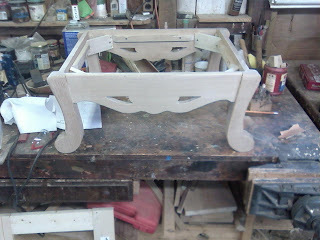 The Joinery is a mix of Mortise and Tenon and Dowels. 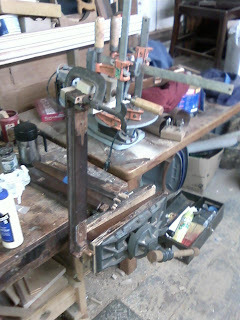 Below are some photos of the gluing of one and the repair on the leg of a second. 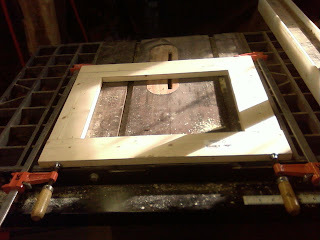 There is also a photo of an old writing slate that was from their family and needed the frame reglued. 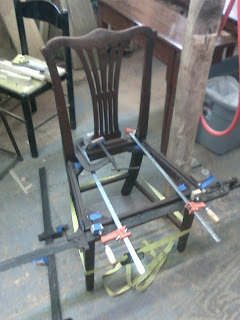 One of the Chippendale chairs (the blue tape on the parts list the location and orientation of each piece. The chair dismantled. 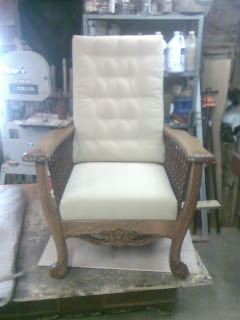 The chair with it's joints cleaned and reglued. Fixing a crack in a leg on a second dining chair before regluing. 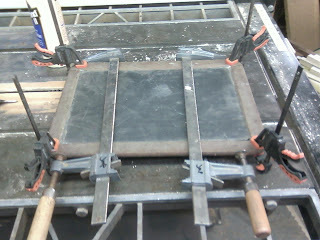 The writing slate getting glued up!